Q. How did the other monsters of the world fare, like werewolves, aliens, fae, and cryptids? A. Depends on the monster. Some cryptids are hunted more enthusiastically now that people know other myths are true, but they don’t know the difference (the ones that exist, anyway). Q. At some point in Shine, you mention that each demon had two angelic counterparts. 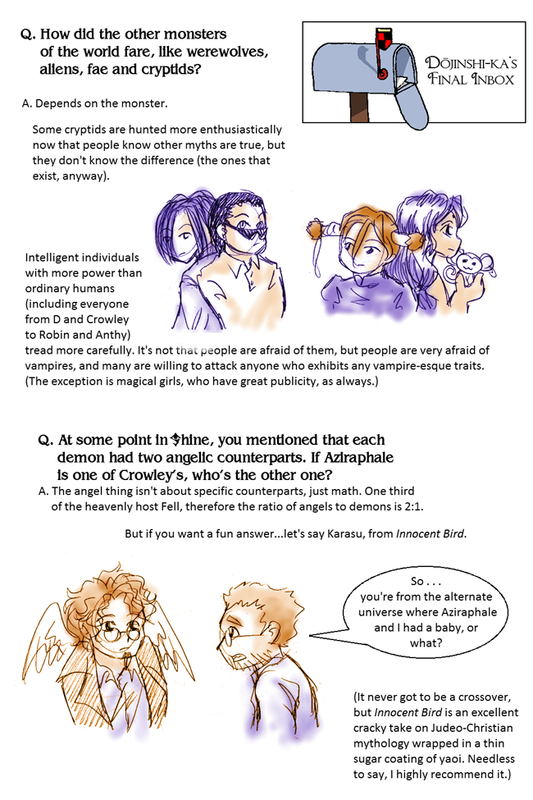 If Aziraphale is one of Crowley’s, who’s the other one? A. The angel thing isn’t about specific counterparts, just math. One third of the heavenly host Fell, therefore the ratio of angels to demons is 2:1. But if you want a fun answer…let’s say Karasu, from Innocent Bird. Anderson: So…you’re from the alternate universe where Aziraphale and I had a baby, or what?